“I need a project of my own,” declares Gail Pool, a Harvard-educated twenty-one-year-old about to accompany her husband, Jeremy, on a trip to Papua New Guinea. Jeremy, a budding anthropologist, is determined to pursue his research agenda among the Baining people, while Gail has decided her project can take any number of directions regardless of lack of traditional education or training. Since Jeremy will be absorbed in fieldwork, why couldn’t she take on a study of her own rather than simply assist him—or worse, be labeled the tag-along wife? This tension, or competition, between Jeremy and Gail is coupled with the inner conflict Gail has around writing about living with the Baining for a year and a half. This engaging memoir is peppered with figurative language and realistic conflicts neatly interwoven into three sections. 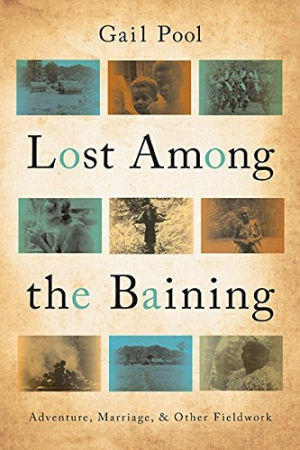 The first, “Lost in New Guinea,” largely set in 1969-70, describes what it was like to live among the Baining, who teach her the way they carry wood, cook taro, and smoke tobacco. In the second section, “Lost in America,” Gail feels haunted by her stay with the Baining and longs to write about what she experienced, but she discovers the task is complicated, particularly by the complexity of attempting to capture the Baining’s way of living using an outsider’s lens. The final section, “Well, This is History,” brings the narrative full circle with its focus on Gail and Jeremy’s 2008 return to the Baining villages. The author does an excellent job of peeling back the layers of how insiders and outsiders might simultaneously realize the tension and intentions that lie between them. Some of the information researchers have perpetuated about the Baining people has been degrading and erroneous. This book, including the black-and-white photos of gardeners, dancers, and villages, contributes greatly to what we now know about the Baining people of New Guinea.